Extention of the product line - sensors and controllers for automatic control and data collection systems. Areas of application: automation of technological processes, transport management, security, electronic payments. The goal is to increase the volume of production, to enter the world markets. Расширение линейки продуктов -- сенсоров и контроллеров для автоматических систем управления и сбора информации. Сферы применения: автоматизация технологических процессов, управление транспортом, безопасность, электронные платежи. Цель: увеличение объемов производства, выход на мировые рынки. Istrim LLC was founded in 2009. A product line has been developed for telematic services ranging from sensors to client software. The company is able to perform a full cycle of development and production of software and hardware systems for telemetry and security. Istrim LLC is fully self-sufficient for ongoing projects. More than a dozen sensors for telemetry and industrial automation have been developed and are mass-produced. The company created prototypes of several types of equipment, which require launching into mass production and development of new client applications. Among popular products are fuel gauge sensors for trucks and agro-enterprises. Target audiences are logistic, agricultural, leasing, security and construction companies. Among state-owned companies, the equipment has been working in the police, forestry and ambulances since 2007. Some controllers are used to perform narrow tasks, for example: for purified water vendor machine, for monitoring the temperature, humidity and quality of the building materials. There are many tested and proved technologies that are ready for use in security systems, smart homes, and passenger transport. 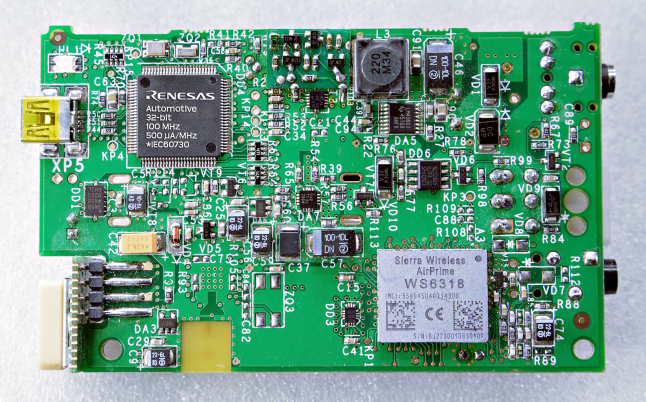 The advantages of our products are flexible system approach, vandal-resistant equipment, high reliability, logging of errors and attempts to intervene, remote update of software and sensors, more than 100 simultaneously connected devices to the address bus, data collection via mobile communication channels, WiFi, Bluetooth, ZigBee, LoRa. The software part is copy-protected at all stages of the product life cycle.